The performances went off without a hitch. Patrick Stump's vocals sounded great and he even improved a bit of Akon's "Don't Matter" in between two songs. 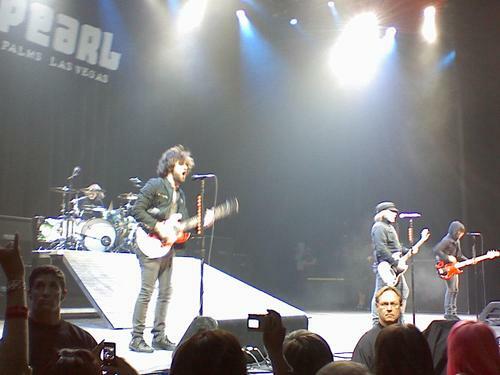 The band also did a cover of Michael Jackson's "Beat It" when a fight broke out in the crowd. Stump immediately stopped the music when he noticed what was going on and security got in the crowd to break it up. Bassist Pete Wentz then jokingly asked the crowd "Did you guys learn nothing from Akon?" while Stump went back to drummer Andy Hurley to let him know precisely when to start back up during the song and when security had cleared out the band jumped back into the last minute of the cover as if nothing had happened at all. Later on the band except for Stump walked off stage while a piano was brought on stage for him to do a solo piano led performance of the song "Golden." After performing "This Ain't a Scene, It's an Arms Race" Wentz announced that since +44 had to cancel their opening set that he called up his 'favorite band' to come perform during the intermission. Out from backstage walk out Breden Urie and Ryan Ross from Panic! At the Disco and the crowd went absolutely insane. 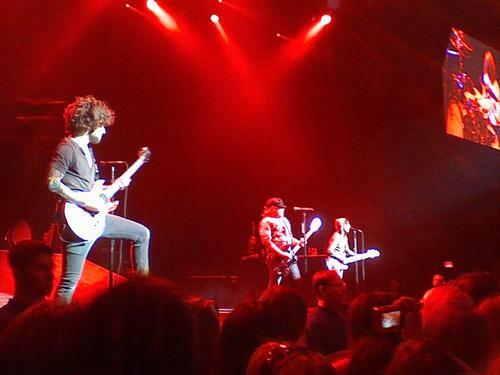 Fall Out Boy had been covering part of Panic's "I Write Sings not Tragedies" while on this tour so there was speculation that the two bands may perform the song together but instead the two Panic members did a four song acoustic set for their hometown crowd, in which during Urie announced that he was moving out of his parent's house and that although cliche, he had never felt any better on stage performing. After performing their mini-set, Mark Hoppus from +44 came out and the three of them performed an acoustic cover of Hoppus's former band's Blink 182's "What's my Age Again." The surprise set was amazing to say the least, Urie's vocals could not have sounded any better and his genuine happiness from performing could be felt all over the venue. 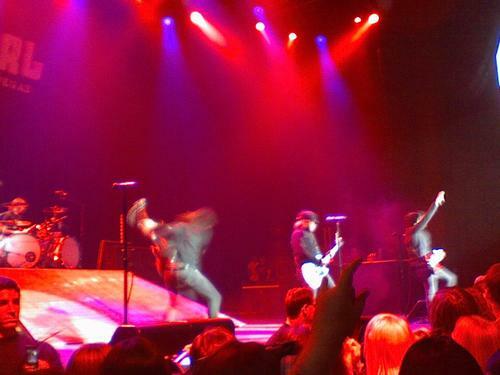 After that Fall Out Boy came back out to finish up their set. 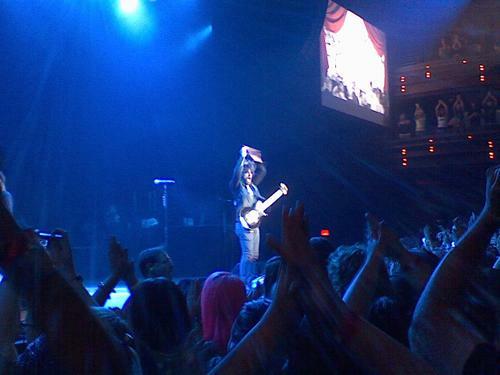 During "The Take Over, The Break's Over" Ross came back out to perform the guitar solo that he contributed to the recording of that song. They also performed the beginning of "One and Only," their collaboration with rapper Timbaland, which led right into "Dance Dance." They closed with "Saturday" and confetti blowers galore showering the crowd. Walking out of the venue, all you could hear were people commenting on how amazing the show was, and for people like me who have seen Fall Out Boy numerous times in different settings, this show being stripped down compared to other shows on this tour definitely put it up there with the top Fall Out Boy shows I've ever attended. Tonight's show was one that fans will be talking about for a long time to come. "Of all the gin joints in all the world"
"I'm like a lawyer with the way I'm always trying to get you off (me and you)"
"Lying is the most fun a girl could have without taking her clothes off"
doood Francis.Wicked pictures.More wicked pictures to come this weekend!! Frances, your pictures came out AMAZING and reading your blog makes me feel like I was personally experiencing the concert! Those photos are so amazing! Your blog is awesome, I can't wait for the next entry! Sounds like a great show! You are so lucky! Great job covering the show Frances! All the shows we've gone to have really paid off! You sound like a Pro covering it! awesome pics, frances! sounds like it was a great show! Frances - YOU EFFIN ROCK!!! Your coverage made me feel like I was there and experienced it myself!! Sounds like you had an amazing time!! Also - great pics!!! I agree with Sara I felt like I was there as well! Amazing job and I am so flipen excited to see more of your blogs!!! Great damn commentary on this FOB show, Frances. I read this hours ago but didn't see a place to offer you some much-deserved mad props. These Billboard badasses have gotta hold on to you. I'm really looking forward t othe Rejects blog. Love those guys! And swanky pics, too! Hey sounds like a great set. wish I was there! This freakin rocks. I love your pictures and your narration hah. I'm so sad that Vegas was such a great show and I missed it! Oh well, I'll see you in Anaheim on monday! That was soo goodd ! Wow, amazing pictures and a great review. Wow! 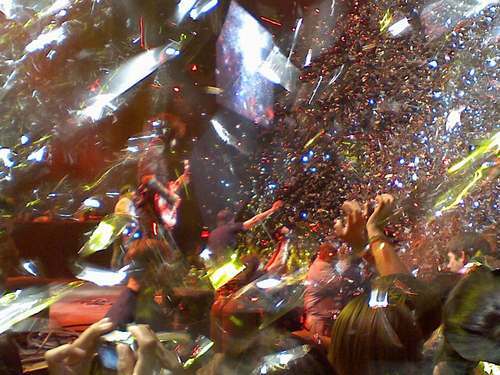 That confetti picture rules. Great review! 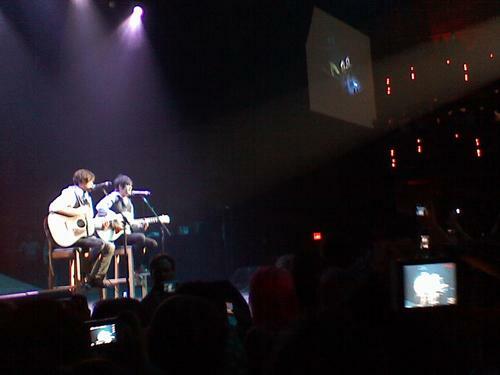 I wish I could've been there...it looks SOOOOO cool! The confetti pic is sweet! I am TOTALLY going to be talking about that show forever! It was AMAZING! And this review totally captures how awesome it was! That confetti picture is great!